Bésame Cosmetics is widely known as a the vintage-inspired makeup brand. If you want the look of vintage makeup products and the similarity of colors that were popular decades ago, then Bésame Cosmetics is your brand! 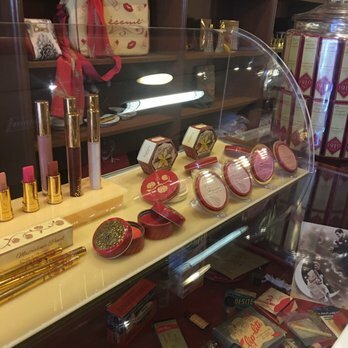 When I was last in Los Angeles, I had the pleasure of visiting Bésame Cosmetics' boutique (technically in Burbank). It is a beautiful boutique full of delightfully vintage-looking makeup, makeup accessories, and perfume bottles. The decor is darling, and there are even displays of actual vintage makeup! The boutique gal was very helpful, knowledgeable, and nice! Display of vintage lipsticks and a compact... so darling! The perfumery section of the boutique... so many lush scents! Unsurprisingly, they were sold out of a few at the time. Customer service at the boutique was excellent. The boutique gal was extremely helpful and took time to explain formulas, history of the boutique, and helped me find my preferred scent (amongst the many perfume scents they create). Prices are fair and there are usually deals. Just subscribing to their email list gets you 20% off your order! Only physical locations are in California. That's it... this brand is amazing. I hope you enjoyed my review on Bésame Cosmetics. Let me know if you'd like a makeup tutorial using the goodies I bought from the boutique! Also, if you use or tried items from Bésame Cosmetics, let me know what you think about those!